Meet Mark Bishop. He’s the father of the thriving, Master’s Touch. I say “father” because while he is the head of the company, it was actually his son, Jonathan, who started the business. Fresh out of high school, Jonathan used his passion for plants to germinate a unique business from their backyard. 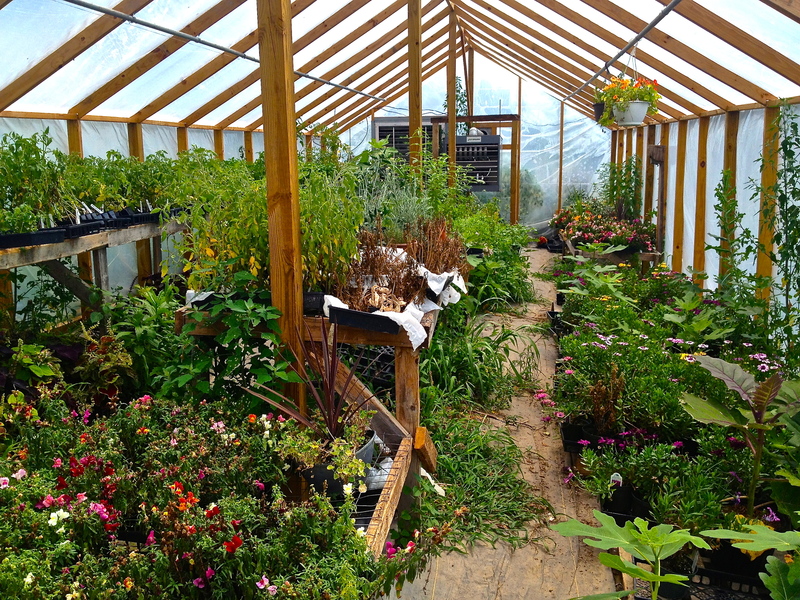 Mark and Jonathan, along with the help of Mark’s other son, hand crafted the three greenhouses and a vegetable garden that are now located next to their home in Berkeley Springs, West Virginia. They began with caring for fig trees. Within no time they found themselves growing everything from vegetables like squash, cucumbers, figs, leeks, and beans to more rare and exotic plants that can now be found in their greenhouses. Mark and Jonathan pride themselves on specializing in exotic, fruiting trees from around the world. Their greenhouses contain specialties such as grape plants, fig trees, olive trees, pepper plants, jasmine, stevia plants and so much more. 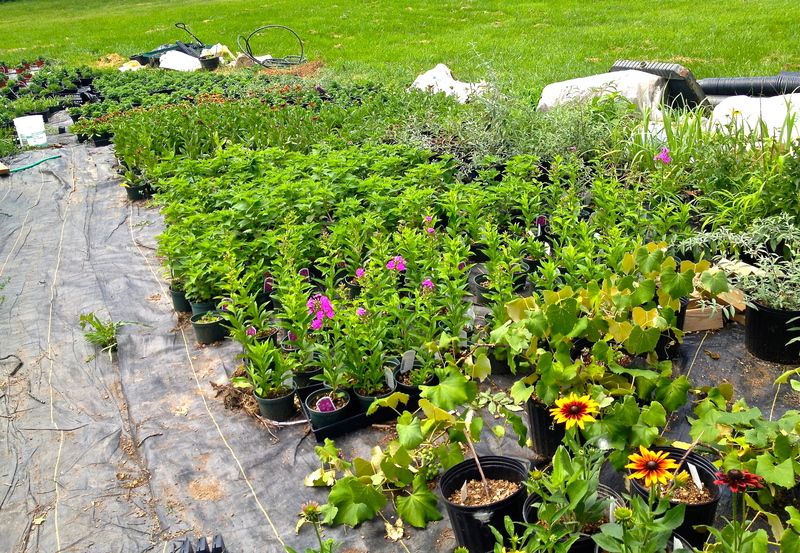 They also grow and sell various annuals and perennials at the markets each week. Everything the Bishops grow is sold at local farmers markets. 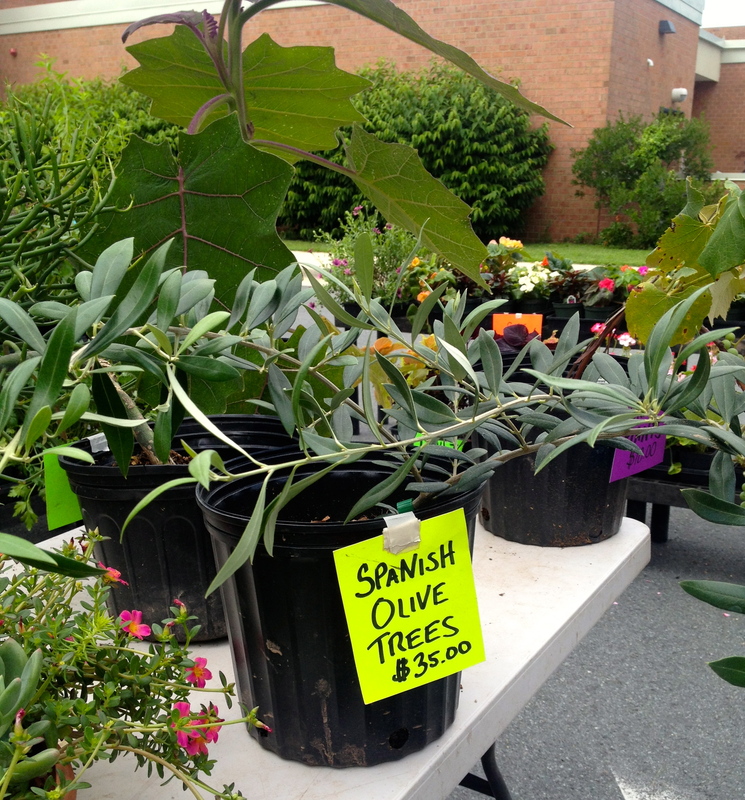 Master’s Touch sells at Bethesda Central Farm Market and two other markets that are located near their hometown. The family happily consumes the product that doesn’t get sold. Walking through the busy Bethesda Central Farm Market, one plant is destined to catch your eye with its is gigantic green and purple leaves. 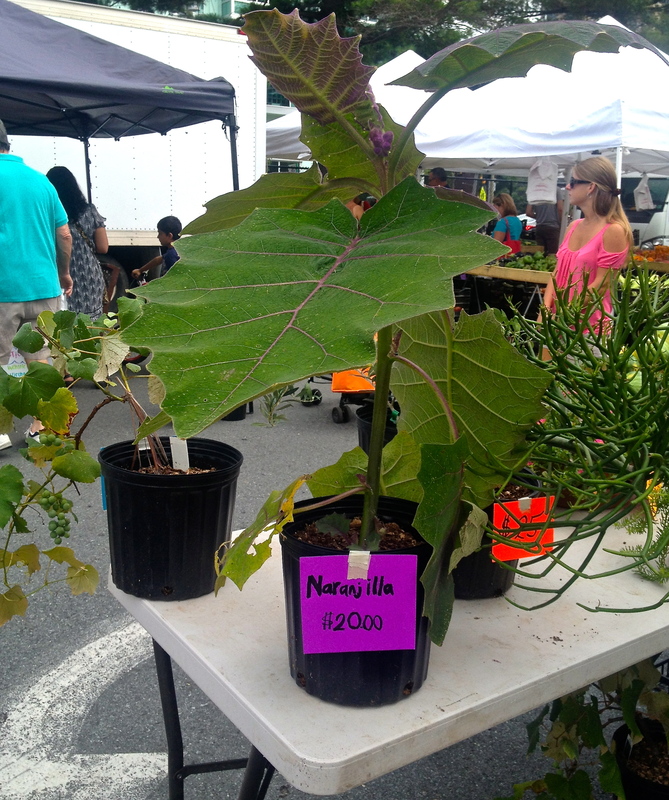 This specialty plant is an exotic fruiting tree from Peru called Naranjilla. The fruit that grows on this tree is a cross between an orange and a kiwi and is used in many dishes in Peru. Another large interesting plant found at their weekly stand is what they call the “sensitive plant.” You have to see it, or touch it to believe it. When the leaves of this plant are touched, the plant’s cells react to the moisture on your fingertips and the leaves retract, like all the fingers closing into a fist! I encourage you to stop by Master’s Touch for a chat the next time you are at the market. Whether it is Mark or Jonathan manning the booth, they are more than happy to answer any questions you may have, as well as acquaint you with some of their exotic species and give you the back stories on their acquisition. For their loyal customers at Bethesda Central Farm Market, Master’s Touch is offering a one-time discount on Sunday, August 3. Four of their more interesting plants will be on sale to readers of the blog! 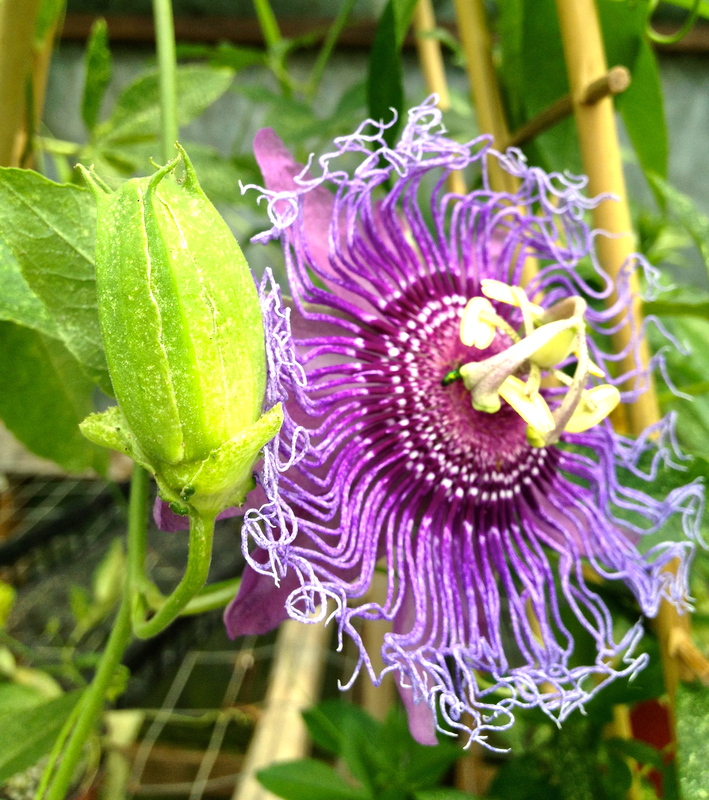 The Passionflower will be discounted by $5, the Naranjilla will be $10 off. 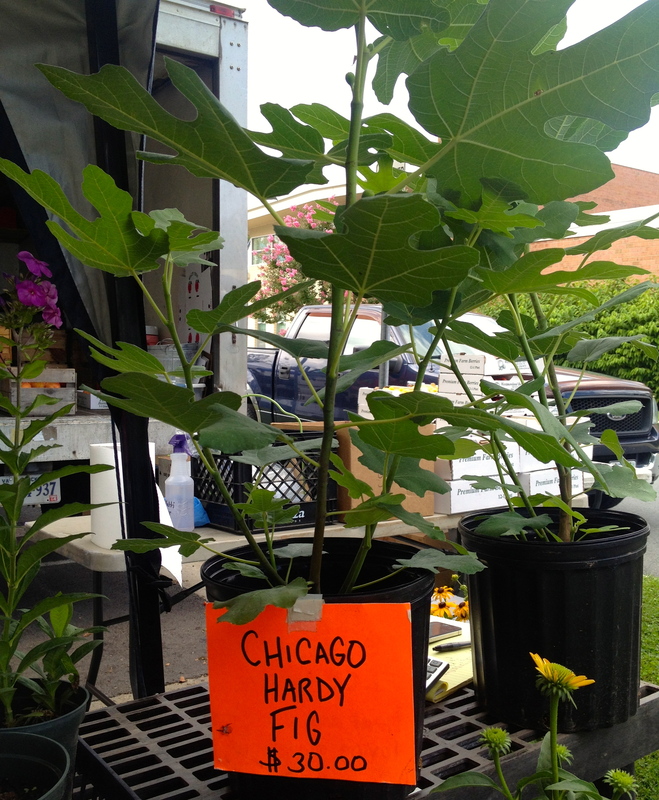 They’ll also take $10 off the price of the Chicago Hardy Fig Tree and the Spanish Olive Tree! 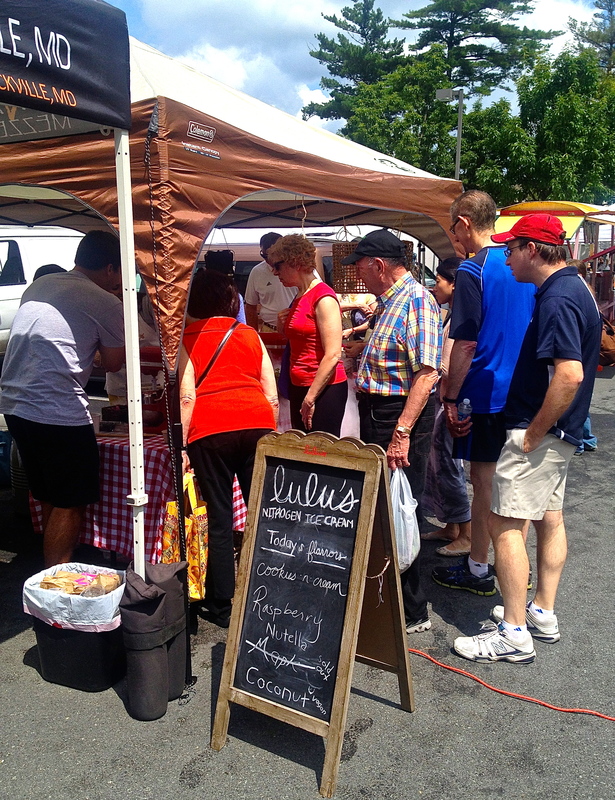 If you’ve been to Bethesda Central Farm Market in the past two weeks, you’ve seen the same thing I have; people crowding around a new vendor, waiting in line for a taste of Lulu’s Ice Cream. You can’t help but notice the large metal bowls lined up, where an enchantingly thick white mist pours forth, looking like a scene straight out of a fairy tale. Luisa Santos, owner of Lulu’s Ice Cream, is the busy woman tending the bowls with a welcoming and friendly charm. In the fall of 2013, Santos was a Political Economy major at Georgetown University. 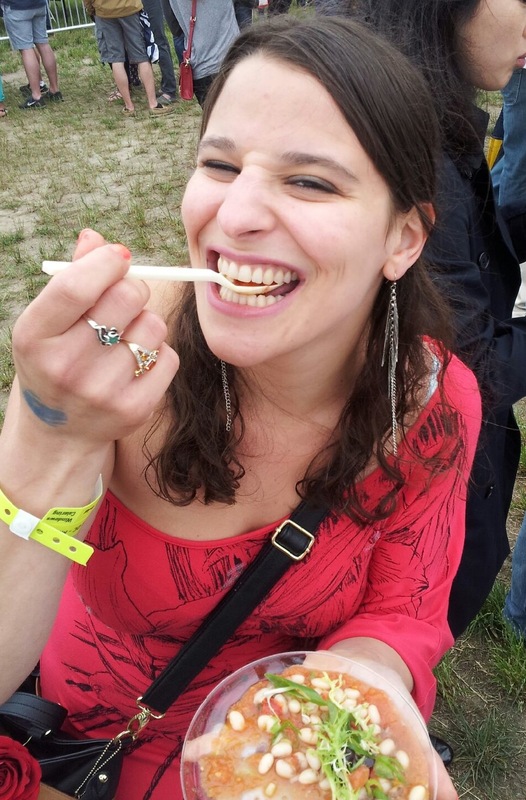 Her passions shifted abruptly when she was first introduced to the concept of using nitrogen to make custom ice cream. After sitting in on lectures and consulting with chemistry professors, her business vision began to solidify. Her first big step was to find liquid nitrogen. Her second was figuring out how to use it! Just one night after making her first batch, she found herself serving 150 people at the Georgetown University’s Fall Fest. A few weeks later, she applied to an entrepreneurship challenge at the University. After taking home both the Grand Prize and People’s Choice, she knew she had a winning idea. Luisa loves experimenting with different flavors of ice cream, many of which use seasonal ingredients from the farm market. She is constantly learning from her customers and her business continues to grow with each passing week. One of the main attractions is the entertaining aspect of the business. There is liquid nitrogen flowing, music playing, Luisa and her friends dancing (and clearly enjoying their work)- while customers enjoy the product! Here’s how it all works. Essentially, liquid nitrogen is introduced into an ice cream or sorbet base while being blended in mixers. The nitrogen causes it to freeze on the spot. This method creates smaller ice molecules, which makes the ice cream smoother and creamier. The most popular flavors in the past have been Nutella, Raspberry (with Westmoreland Berry Farm berries), Hint of Mint, Cookies and Cream, Piña Colada and Coconut. The last two are made with coconut milk so they’re vegan! Luisa says making ice cream this way allows her to get “back to basics,” without using emulsifiers or preservatives. As a pastry chef myself, imagine my surprise when Luisa told me she doesn’t use eggs (a very common ice cream ingredient) in any of her recipes! All of her milk is local, whole milk and her crew takes great pride in purchasing as many ingredients as possible from other vendors at the Bethesda Market. This week Lulu’s will feature fresh peach ice cream made with peaches from Toigo Orchards. 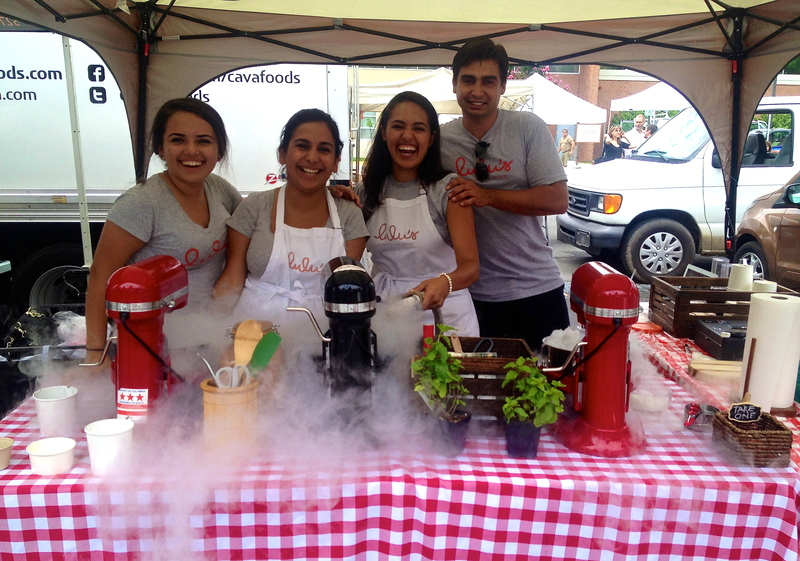 Luisa and her team are very excited to be a part of the Central Farm Markets family. 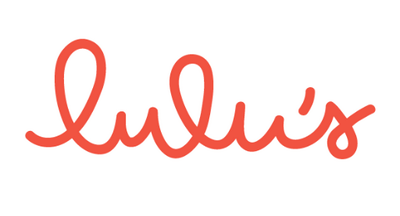 Lulu’s Ice Cream is looking to expand someday, fulfilling Santos’ dream of opening a store-front! 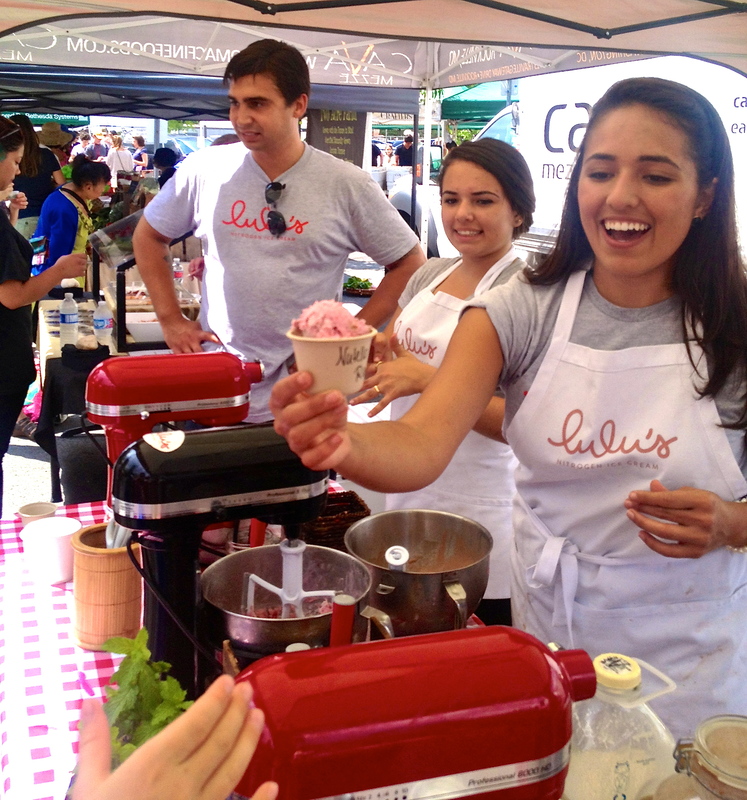 Come by the Bethesda Central Farm Market this Sunday (July 27), mention this blog, and get $1 off any size scoop from Lulu’s in honor of National Ice Cream Month! And come early…it goes fast! 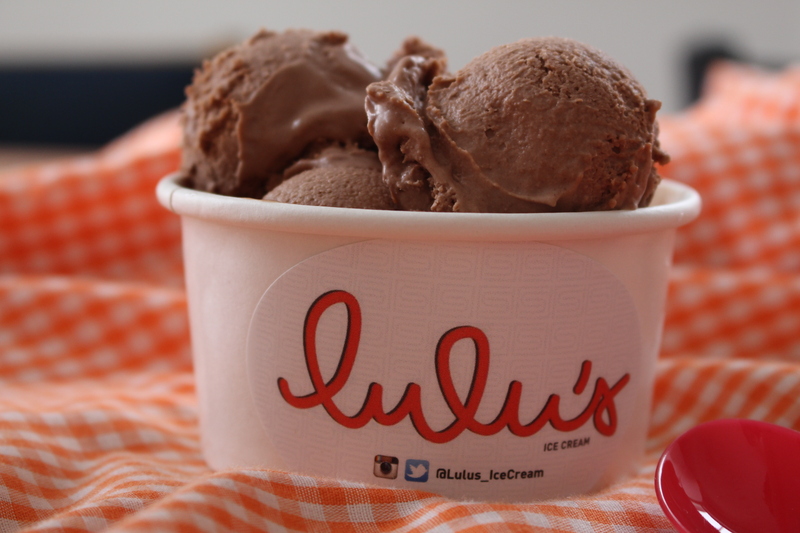 Connect with Lulu’s Ice Cream online – like them on Facebook and follow them on Twitter! After 7 years as a public accountant and 13 years as a corporate VP at Legg Mason, Shane Hughes decided to do something different with his life. He spent his childhood living on farms, and returned to live on one 12 years ago. 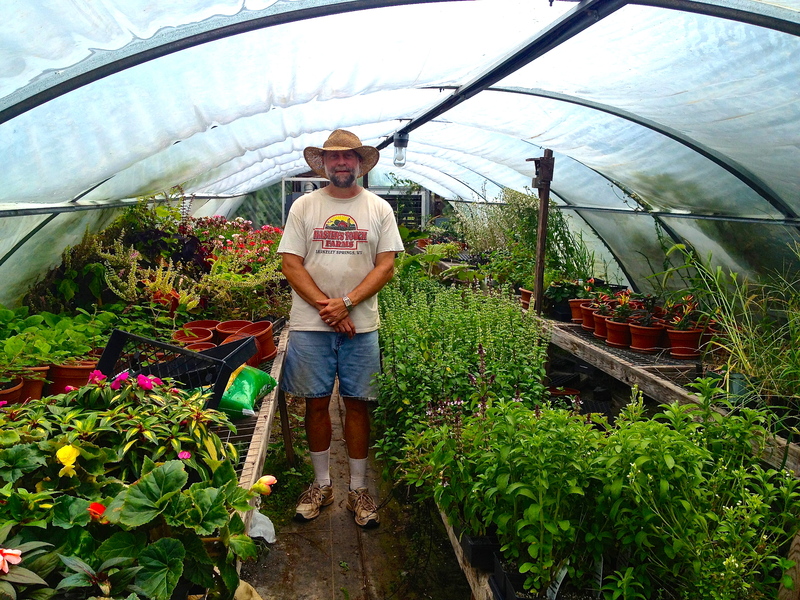 It wasn’t until 2008 that he decided to take the plunge into and start Liberty Delight Farms. If you’ve ever talked with Shane, chances are you walked away with a smile on your face. His passion for and deep knowledge of animal husbandry is remarkable. He can chat with you about anything from your pet dog to your most recent barbecue. If there’s one thing Shane wants you to know about his business, it’s how well he treats his animals. 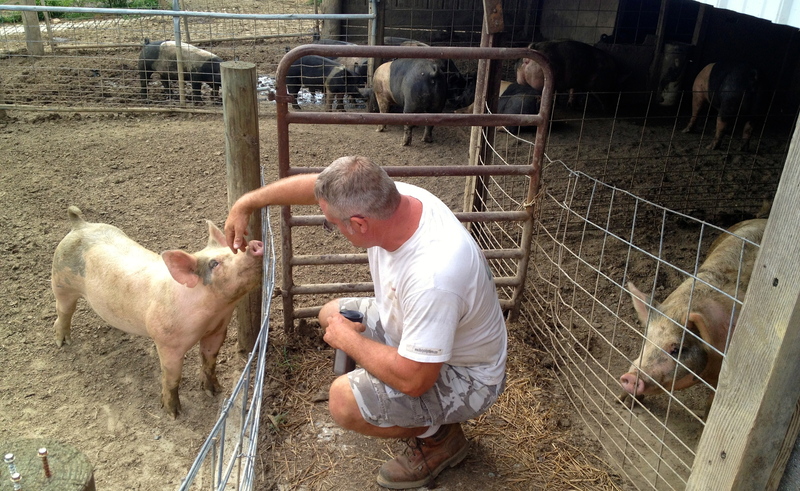 He points out that it’s very important for the consumer to understand his farming practices and how much thought and preparation goes into properly caring for the animals. 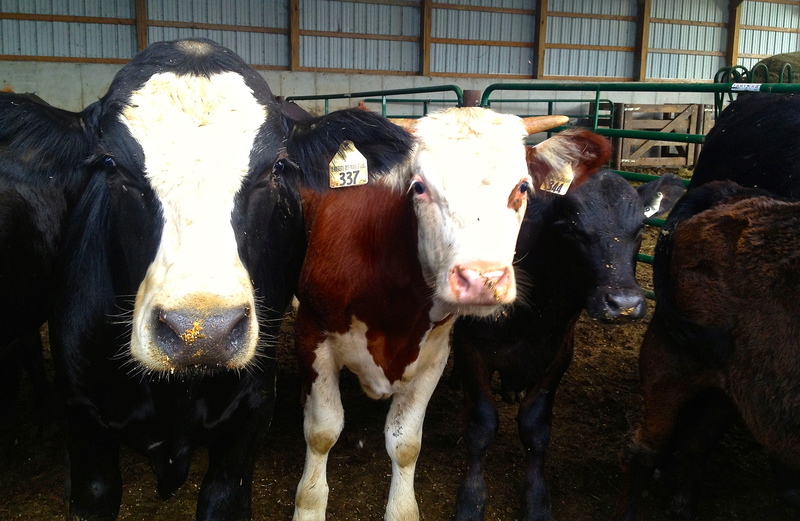 The cattle we saw in the barn were primarily steer, with a few cows milling about. Shane told me about the natural feeding process – how he grows hay for the cows to eat and mixes “haylage” in with their feed, which is wet hay that has been mowed and chopped. This holds more nutritional value than plain hay, gives the cattle more protein and is more easily digested. 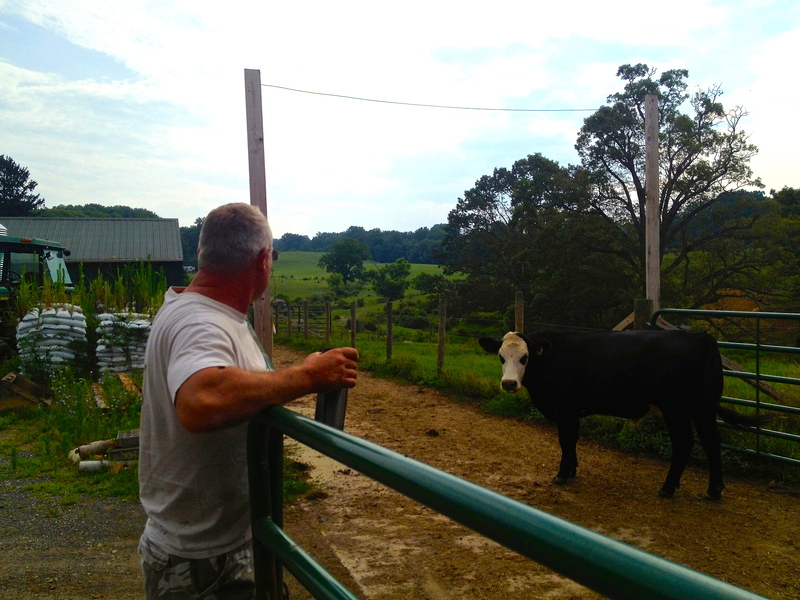 It is always nice to hear when a farmer cares so much about what their animals eat! Later in the day, we took a drive out on the hills and found a group of cows and their calves relaxing in the shade near a stream that runs through the farm. My favorite part of the farm was the pig pen. Pigs are so smart and fun to watch. A few of them came up to me wagging their tails and sniffing – I almost felt like I was interacting with a dog! These lucky pigs, who are about 6 months old, eat very well. Shane gives them deli scraps sometimes! Next stop was to see the chickens. Shane keeps them rotating through appropriately sized pens. He makes sure that as they grow, they are always given room to do whatever it is loud, chirping, growing chicks need to do! The same area housed a few rabbits that Shane is breeding. 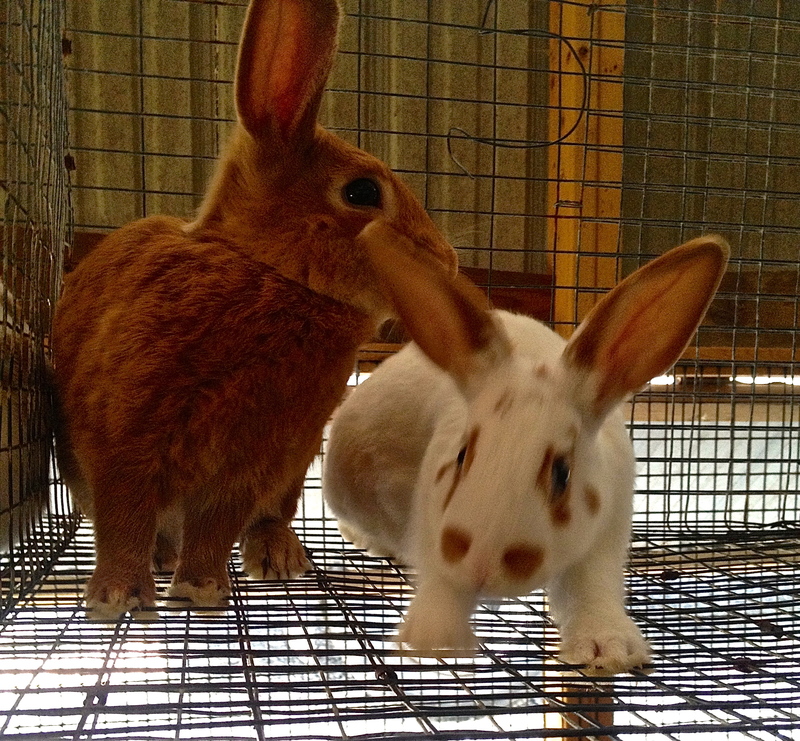 He plans to open a whole new structure just for breeding and housing the bunnies, as his demand for rabbit has been growing. Shane has laying hens for eggs, although he tells me he used to have a lot more before a fox found his way into their cage! The lamb and turkey that Shane sells at the markets are raised on his farm by another farmer. It is clear that Shane loves what he does. I encourage you to take a moment to talk to him at the market, ask to see pictures of the farm and ask which cuts of meat works best for your dishes. Shane is all about helping customers understand what he does. He encourages consumers to be interested in the process and invites everyone to come visit his farm! Liberty Delight Farms is at all three Central Farm Market locations. Mention this blog post on the weekend of July 19-20, and in honor of “National Hot Dog Day” (July 23rd), Shane will give you a package of hot dogs 50% off! Connect with Liberty Delight Farms online – like them on Facebook and follow them on Twitter! Welcome to Dishing the Dirt! My name is Diana Ash and I am Central Farm Markets’ new Market Personality/Blogger. Born and raised in Bethesda, I grew up with a mother who was a gardener and a caterer. From a young age, I had my hands in the dirt and my brain in the kitchen. I’m very farm-to-table oriented; I like as little interference between those two stages as possible. I graduated with a degree in Hospitality Management at The Universities at Shady Grove, where I majored in culinary arts and restaurant management. I currently work for the Montgomery County Food Council as their Communications Director. 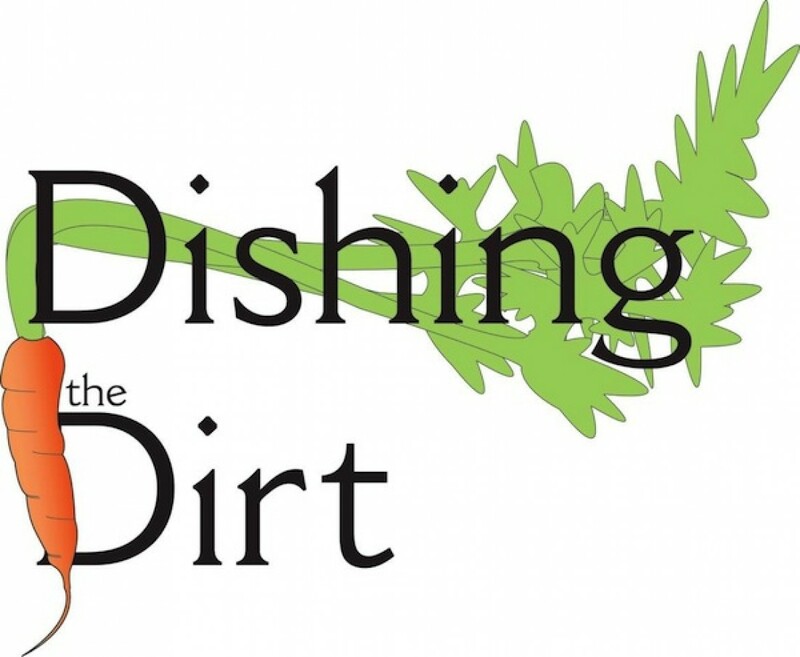 I’m a foodie to the max, but I’m also inspired by environmental growth and sustainable efforts. I love everything involving a farm and a kitchen. Throw some family and friends into that equation, and I’m in heaven! My main goal with Dishing the Dirt is to share some of that passion with YOU, Central Farm Markets’ loyal patrons. I want everyone to be excited about their food – where it comes from, how it gets to CFM, and how it tastes so good. I want you to have a friend in me – someone with whom you can share recipes, tell stories, and help play a part in bringing more community to these markets. My plan is to bring you stories from the vendors by visiting their farms, kitchens and homes. I’ll bring news about the growth of Central Farm Markets, share in holiday celebrations and “National Food Days,” and explore special items found at the market. My door is always open and my ear is always available for a chat. Let’s all eat healthy and support our farmers and vendors together!